This Wine & Dine Wednesday post is coming to you on a Thursday. I made this last night and could not wait until next week to share. SO simple and very tasty. We had this with roasted cauliflower topped with a sprinkling of Parmesan and a sweet potato for supper in on a chilly night. Of course, oven to 400 to pre-heat while you get things together. In essence, you are making a vinaigrette to roast the chicken and shallots in, as it is 3/4 of a cup of balsamic and 1/4 of a cup of extra virgin olive oil. If I were making a dressing for a salad, I would reverse the amounts, but whipping it up in a bowl with salt and pepper felt exactly like making a vinaigrette. 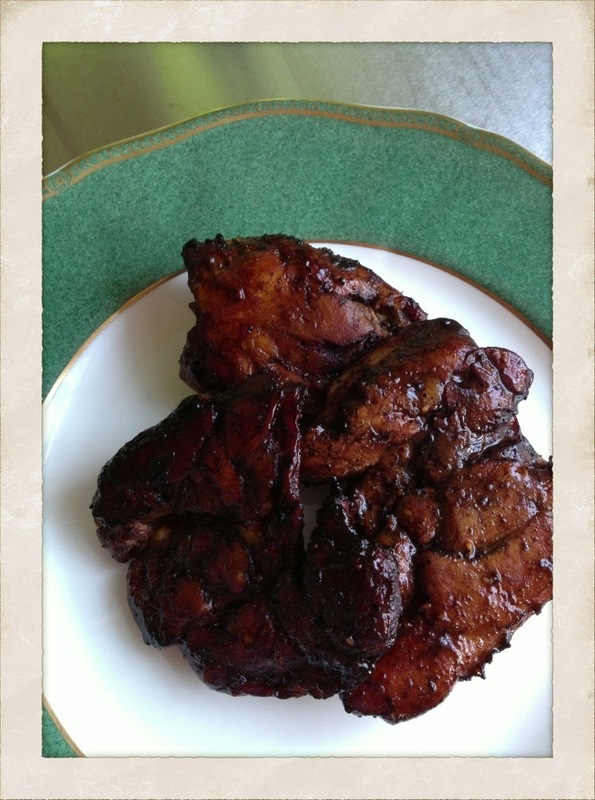 Take skin on chicken thighs that you have salt and peppered and place them in a baking dish. Add a good amount of shallots to dance around the chicken pieces. I halved and quartered the whole shallots after I peeled the casings off of them. Then pour the vinaigrette over all. Bake for 45 minutes, turning the chicken at the half way point so both sides get immersed in the balsamic mixture. Test chicken with a thermometer, it should read 160. When done, take out of oven, cover with aluminum foil for 5 minutes to rest while you plate up the rest of the meal. I mean, truly, so easy. Yet incredibly satisfying. Enjoy! 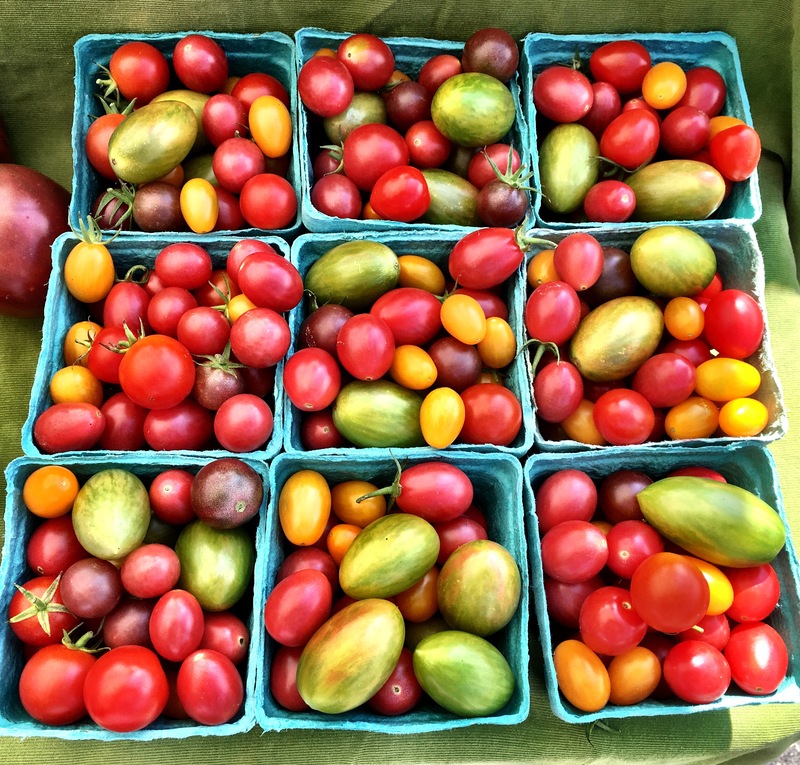 This is the time we wait for all Summer when the farm stands are brimming with fresh tomatoes in all sorts of colors, shapes & sizes. 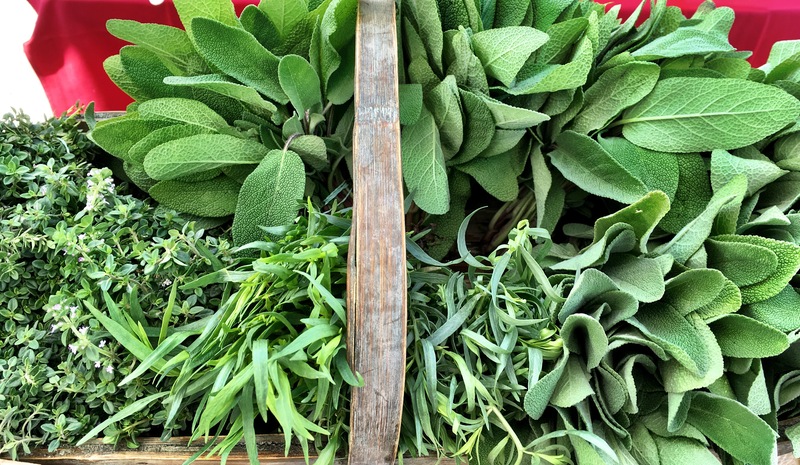 It is also when herbs are growing like weeds and you want to use them in every possible thing, in every possible way. Slicing the tomatoes up and having them simply with sea salt is about as easy and satisfying as it gets. The purity & simplicity hard to beat. Then try tearing up tarragon with a splash of white wine vinegar for a twist. 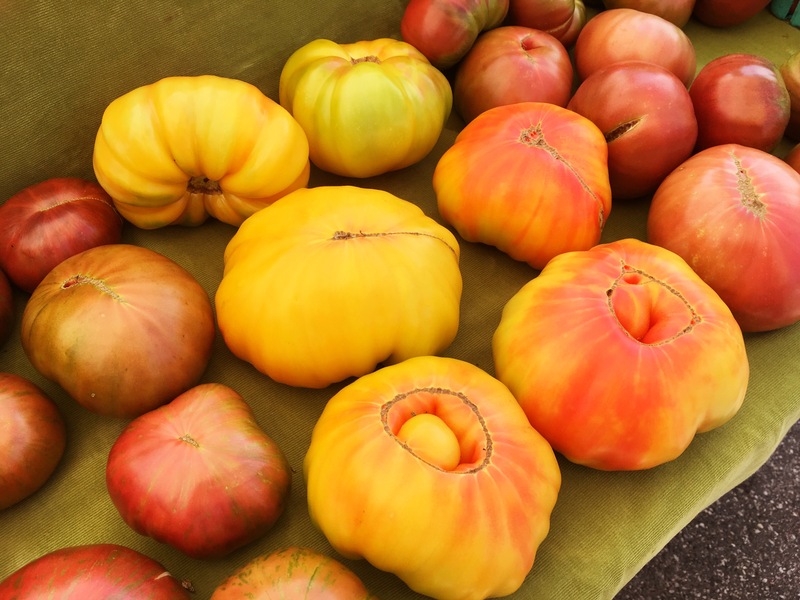 Or serve with mozzarella or burrata along with basil for a Caprese twist. 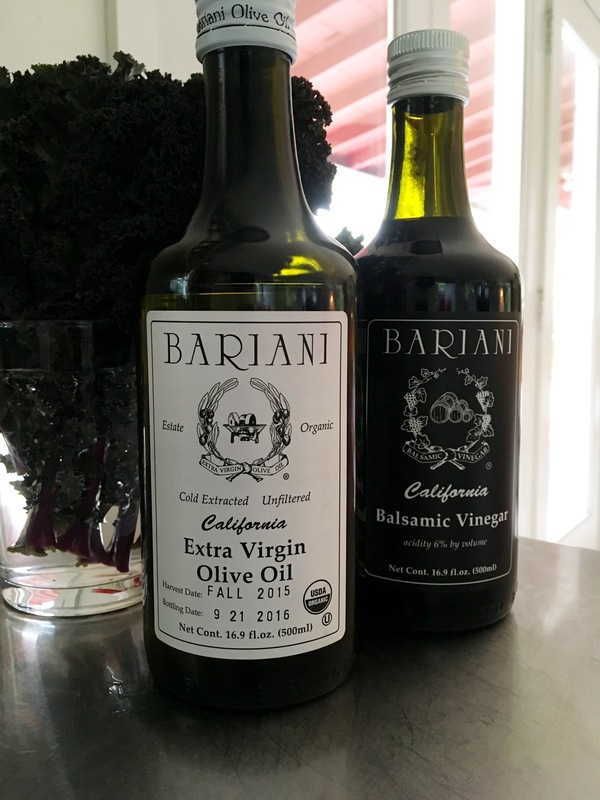 Bathed in just the very best extra virgin olive oil is sublime as well as a heavy hand with the balsamic. However you chose to slice it, enjoying the heck out of them this time of the season is just pure joy. We have a new category, as this fab duo is On Its Way, so am excited to share this all with you. These were a find at the Fancy Food show in San Francisco a few months back. I was struck by this combo as I thought it would look great out on the counter together, as well as make an awesome host/hostess gift. The quality of what is in these cool bottles is off the charts, so it hit all of my winning points for what makes it onto our shelves. Vinaigrette anyone? I asked Mister Sive to step in on this one as he created an amazing onion dish that I really wanted to share with you all. A really yummy side dish perfect any time of the year. This past Thanksgiving was the first we’ve hosted in quite a while. Like many, I love to cook holiday meals, especially combining old favorites and new explorations. This year I was inspired by the fab variety of onions at Sosio’s vegetables in the Pike Place Market, and my memories of Mom’s creamed onions. But, I thought, let’s do something different… Here goes. For the base, cut the large red and white onions in half, and then in 1/3 inch wide strips. Cut the shallots smaller, but not diced. Melt your favorite combination of a few tablespoons of butter and olive oil in a pan, and sauté the onions until just cooked through, maybe 3-5 minutes on medium to high heat. Towards the end, add a few good dashes of balsamic, and cook a minute or so, until the balsamic has infused the onions and the mixture starts to caramelize. Take off the heat, and with a rubber spatula, transfer to a low wide porcelain dish so that it’s an inch or so thick. In the same sauté pan, add a bit more olive oil and/or butter, and flash cook a teaspoon of the thyme. 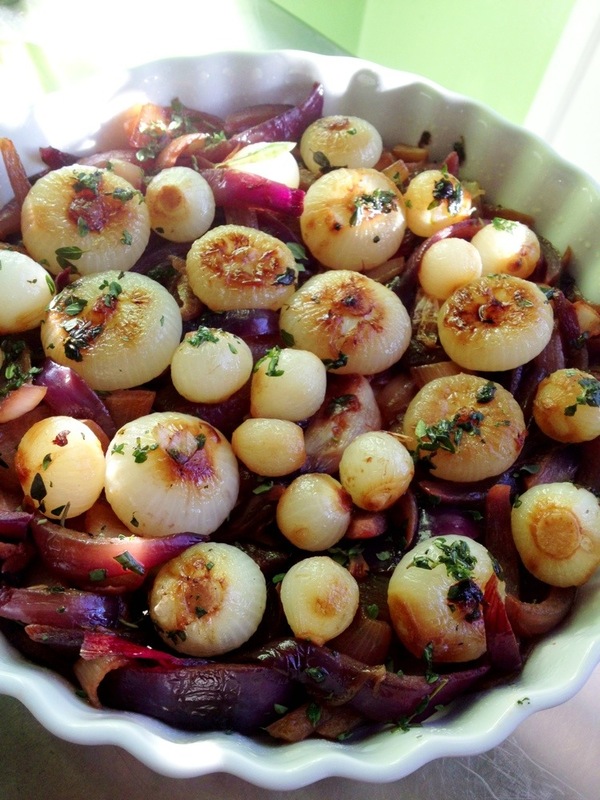 Add the cipollini and pearl onions (starting with the larger ones) and cook until just browned. Add 1/2 a cup or so of stock, enough to cover the onions maybe half-way, and cook on high heat until the onions are cooked through and the stock has reduced by at least a half. Add another 1/2 to 1 teaspoon of chopped thyme to ensure each of the whole onions has some good herb coverage, and then distribute the whole onions and any liquid over the bed of the balsamic glazed onions. This dish is rich in earthy and herbal tones. Along with the punch of the onions it’s a great side with any roast, turkey, chicken, and I think pork especially. Happy Holidays from the Other Ted! 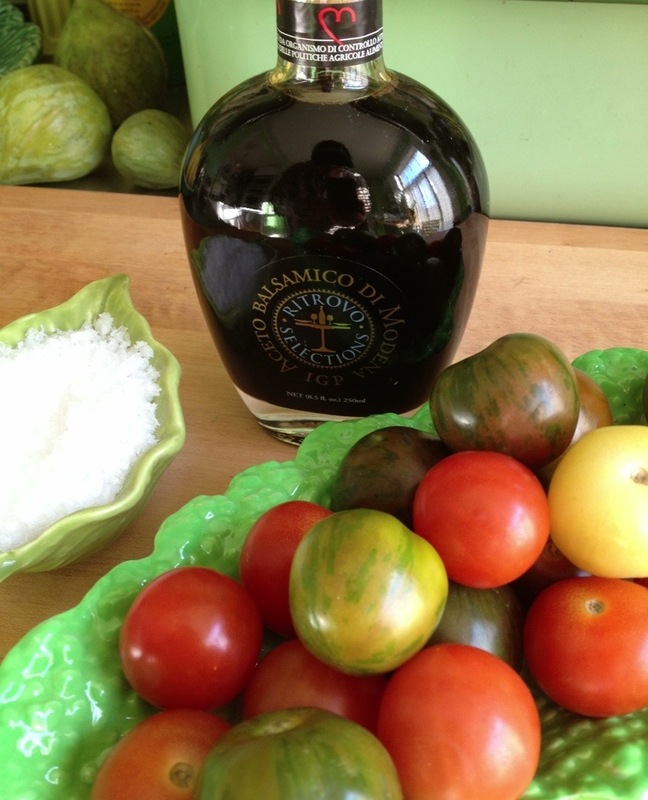 A good bottle of balsamic can transform so many things. For the easiest, simplest, quickest salad just cut up small tomatoes in half, sprinkle with salt, then drizzle with the balsamic. I find it so interesting why we grab for the same things over and over again when we are cooking. I guess it becomes comfort in familiarity. The other day I grabbed for something I have never used when it comes to cooking chicken, balsamic vinegar. Balsamic is something we like and cook with quite a bit, but I had never used it on chicken. Saturday morning was my initiation. We take the ferry over to Vashon in the evening, so we always have dinner in the car. Often times it means picking something up in the Market that day, or stopping and picking up quick take-out on the way to the ferry. But the thing we most like is when it is a home cooked meal. This is where the balsamic glazed chicken comes in. We had boneless, skinless chicken thighs in the fridge so that is what I used but I think this would work really on any cut of chicken. Turn oven to 400 while you get the chicken ready. This really is so darn easy so don’t blink or you might miss it. Put chicken pieces in a baking dish. Pour extra virgin olive oil over the chicken to thoroughly coat. Sprinkle all with salt & pepper. Next liberally dose the whole lot with balsamic vinegar. Put in oven and bake for 15 minutes. Then take out of the oven and turn the chicken pieces over, spooning the liquid in the dish over the chicken and return to the oven. Bake another 15 minutes and then check the internal temp of the meat until it reads 160. Times vary depending on the meat thickness. Cook until it gets to that temperature. Once there, take out of oven and cover dish with aluminum foil for 5 minutes. Done. Really could not be easier. Truly. The chicken gets this amazing caramelization on it and becomes so tasty. I sliced it and we had it over a big kale salad which had cherries and corn in it. A one bowl car meal enjoyed as the ferry took us to the island. One of the fun aspects of writing this daily blog, is folks recommend other people to me who write blogs that they think I should read or meet. I was not a big blog reader before I started writing mine a little over a year ago, but have really enjoyed perusing more and more. I love a mixture of blogs–design, food, art, lifestyle–and will share with you in the coming months some of my favorites. The above salad combination was from a post by the talented interior designer in San Francisco, Grant K. Gibson. He writes a lovely blog about the things that inspire him at www.grantkgibson.blogspot.com. He also is an exceptional photographer, whose work will be showing up shortly on the walls at Watson Kennedy any day now. More on that once it arrives. Now onto that fab salad. 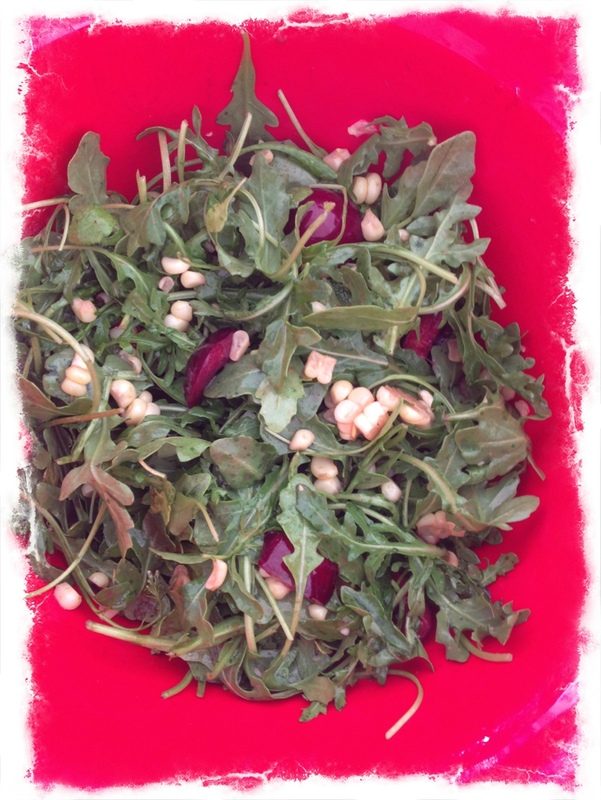 I have made this salad 3 times, each time doing a little something different. The first time I did it with the baked chèvre as Grant had shown. I also made it for a large dinner party and instead crumbled feta into the salad in place of the goat cheese and it rocked, as well. The feta was just an easier option since it was such a large salad for a big group. We have also had it without any cheese added, and it is sublime. That is what I love about recipes, that you can add or delete and still make something wonderful. This is super easy, and could not be tastier and representative of Summer. Take the corn off of the cob after you have boiled it and it has cooled. Pit or slice cherries, you just don’t want the pit involved. Make a simple vinaigrette of 1 tablespoon of Dijon mustard, 1/4 of a cup of balsamic vinegar, 3/4 cup extra virgin olive oil, 1/2 teaspoon of both salt and pepper and whisk all together. 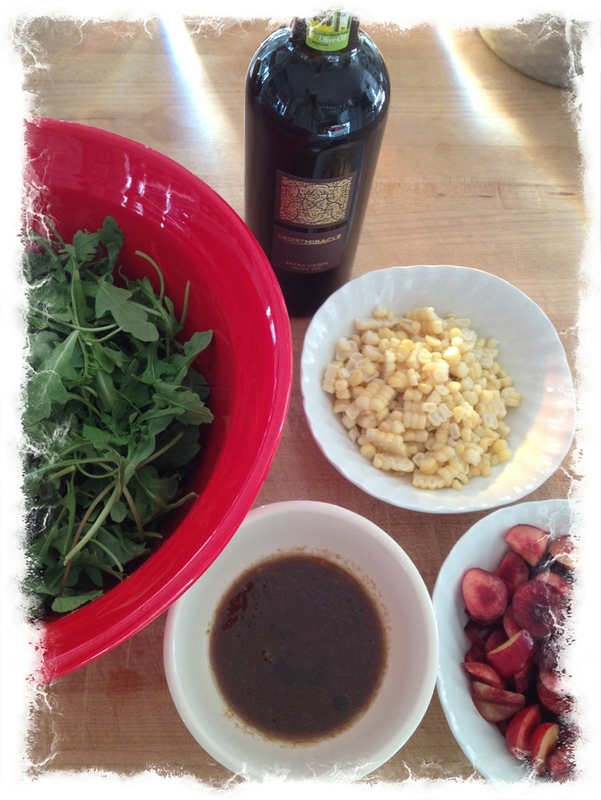 Combine the corn and cherries with the arugula and dress with the balsamic vinaigrette. You will be very happy you made this salad. Try any of the cheese options or not. Enjoy! When my friend Radiance called and said she was working for the local catering company, Gourmondo, and that I had to try an incredible dressing they were starting to package and sell, I was a tad hesitant. I am not usually a bottled dressing kind of guy. But this was Radiance, so I knew she would not be calling unless she thought I would really like it. “Like it” is an understatement. 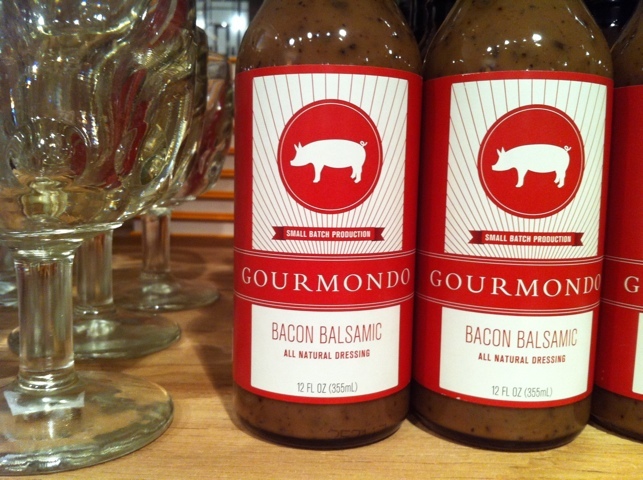 The bacon balsamic is so good, I can’t really see not always having a bottle of it in the fridge. 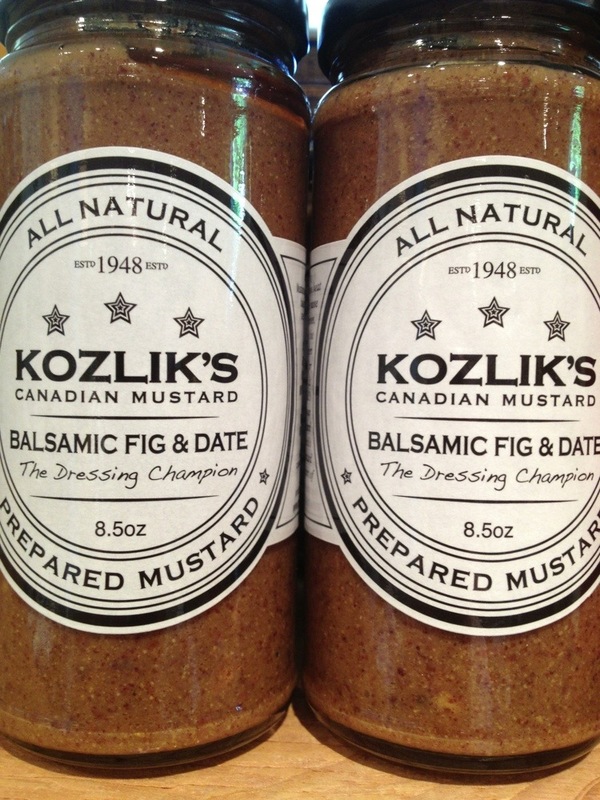 Made with alder smoked center cut bacon, it is infused with custom blended olive oil and balsamic to create a very rich and creamy dressing. I have been serving it over full leaves of Romaine that I just cut the root off of, layer them on the plate, and then drizzle the lettuce with the bacon balsamic. Easy, easy, easy and so yummy. The bottles have been selling like crazy at the shop. I guess there are already lots of fans. Plus I love the graphics on the bottle. A double winner in my book. This photo of the watermelon was taken when we were out at the Wells’ beach house on the North Fork of Long Island a few weeks ago. Irene was not so kind to many parts of the East Coast, but luckily, our beloved cabin weathered the storm. This post is an ode to the magical times we have spent there, and the many bowls of watermelon we have savored out of that festive & jaunty red dotted bowl. 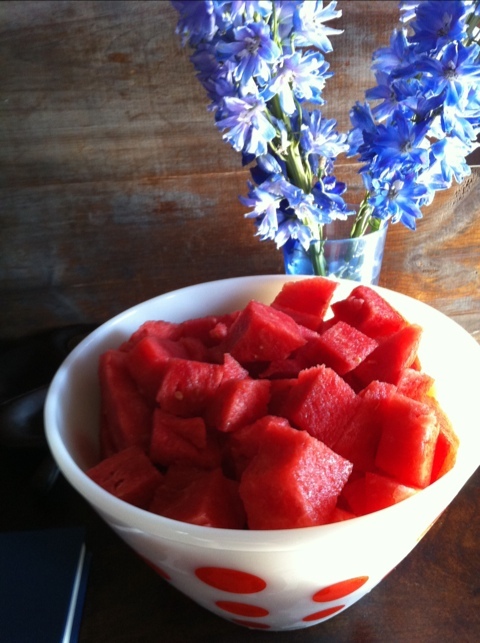 To make watermelon part of your main meal, give this a try. Cube watermelon, break apart pieces of Greek feta, and sprinkle both with an aged balsamic. Heaven. The combo of sweet, tart and salty is divine.